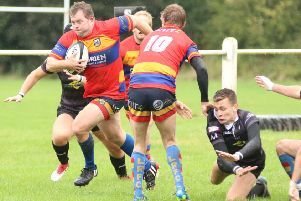 Another dominant forward display allowed Old Leamingtonians to run out comfortable winners against league newcomers Stoke Old Boys, writes Nick Crighton. From the kick-off the home side took control of the game and after only five minutes of play Oscar Heath touched down wide out on the right after the OLs forwards had gained good ball. The flowing three-quarters move saw the full-back come into the line and cross for the first of his two tries. Old Leamingtonians winger Callum Semple hands off a Stoke Old Boys tackler. The conversion attempt by Henry Reynolds was successful. Old Leamingtonians regained command straight from the restart, with their forwards driving deep into the Stoke Old Boys half. From good rucks, clean ball was thrown along the backs to allow left-winger Callum Semple to cross for try number two, again converted by Reynolds. OLs continued to dictate the half with the home forwards’ dominance preventing the Stoke Old Boys backs any decent ball and it was only a matter of time before further tries followed. The third converted try was scored by centre Tom Eales after another flowing move and this was closely followed by a second try from Heath, this time unconverted. Shortly before half-time after further dominant play from the home forwards, the ball was quickly thrown along the three-quarters for Eales to touch down for his second try of the afternoon. The conversion was missed but the game reached the half-way stage with Old Leamingtonians holding a comfortable 31-point lead and having secured a bonus point for scoring four tries. The bulk of the second half followed the same pattern with OLs dominant and after a series of forward drives the home side were awarded a penalty which was kicked to touch. From the resultant lineout, second-row Joe Tallamini broke free to cross the line for try number six. The conversion from wide out was missed. The final Old Leamingtonians try came after Eales spotted a gap in the visitors’ defence and ran through unchallenged to touch down between the posts for his third score of the afternoon. The score was converted by Heath to give OLs a 43-point advantage. With ten minutes to go the game was reduced to passive scrums and OLs’ forward dominance was removed, allowing Stoke Old Boys to create chances of their own. The Old Leamingtonians defence held out until injury time when the visitors crossed for a consolation try which went unconverted. n Old Leamingtonians Ladies are marking the 30th anniversary of ladies’ rugby at the club with a celebration in their clubhouse tomorrow evening (7.30pm). There will be food on offer and live music from Thom Kirkpatrick. Entry is £5, with current and former OLs Ladies players being admitted for free.